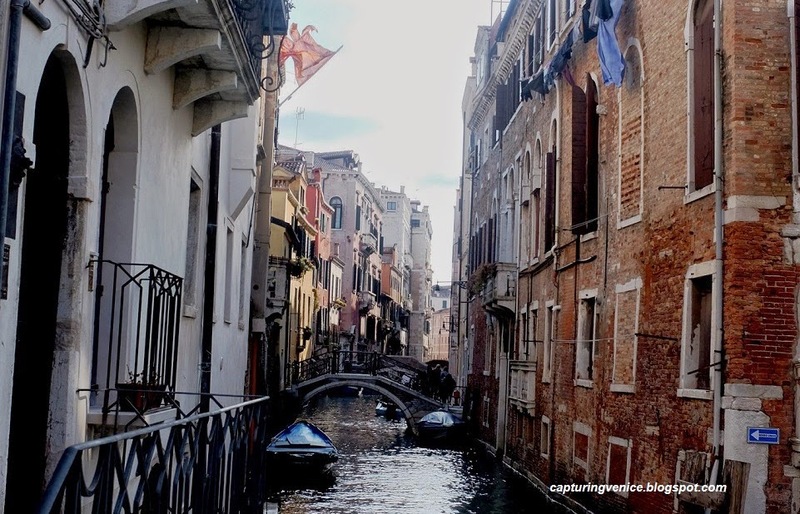 Capturing Venice : Yes, really, I'm STILL standing on the Ponte dei Conzafelzi! Yes, really, I'm STILL standing on the Ponte dei Conzafelzi! And still, I'm standing here on the bridge, drinking in Venice, gulping in the sight of the canals, the bridges, the light, the colours, the brick, the quiet, the history, the many ancient and modern and contemporary lives that have passed to and fro, over this bridge, under the bridge, built, lived in and animated the houses around me. I stand on the bridge, I look down this canal and I take in the sight of the sun sparkling on the water, of the proud red and yellow of the Venetian flag flapping lazily in the breeze and I'm so happy that I've had the opportunity in life to fall in love with Venice. Very eloquently put. And I just love this photo - for all of those reasons. It really captures the essence, the mystery and the uniqueness of Venice, doesn't it?